A liquid manganese fertiliser for foliar application on all types of horticultural crops. 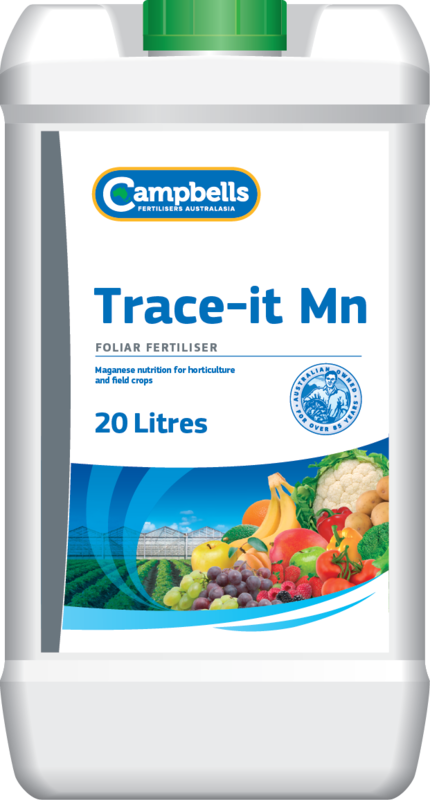 Campbells Trace-it Mn is a liquid fertiliser that is ideal for the correction or prevention of manganese deficiencies in many horticultural crops. Trace-it Mn is sulphate based and is available to the leaf for immediate foliar absorption. Manganese is involved in many essential plant functions, including photosynthesis and the making of proteins. Manganese can be unavailable to plant roots in many different growing media and soil types, particularly alkaline soils. Foliar feeding of Trace-it Mn is a very effective means of supplying additional Mn when demand is high or uptake is through the roots is inadequate. Campbells Trace-it Mn is recommended for foliar application. Recommended rates of application vary between 1 to 5 L/ha – specific rates will depend on the crop, stage of crop development and the manganese requirement. Before application, seek advice from your Campbells Trace-it Mn distributor or your local agronomist.